Neighbors say crews were sluggish to respond because the fire station across the street is under-equipped due to budget cuts. San Jose firefighters knocked down a four-alarm blaze that swept across several Victorian-style homes downtown Friday afternoon, causing "considerable" damage, a fire spokesman said. Residents rushed out of the burning buildings in the 400 block of Auzerais Avenue shortly after 12 p.m., fire Capt. Christopher Salcido said. Numerous pets as well as a woman with a disability were carried to safety. When firefighters arrived they found heavy smoke and flames coming from a single-story home, which prompted for a second-alarm response, Salcido said. The fire, fueled by building materials, trash and chemicals in the backyard, erupted across the street from a fire station, but neighbors were upset because the facility doesn't have an engine that carries water. 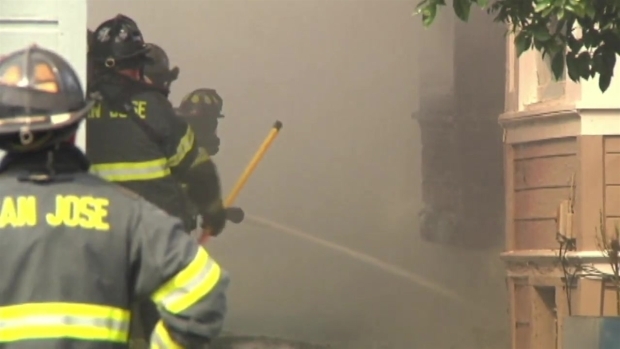 San Jose firefighters knocked down a four-alarm blaze in downtown San Jose Friday afternoon. The fire broke out inside one home and quickly spread to several other units. Investigators say they aren't sure whether the building materials, trash and chemicals helped the fire spread to the other homes. The fire didn't take long to go to four alarms, with 25 trucks and engines, and 72 firefighters responding. One resident, student Ruben Mendoza, rescued his mother and their pets. "I saw smoke coming into my bedroom from the other side of the house, and my initial reaction was 'something's wrong,'" Mendoza said. "So I got up immediately, grabbed my mother, who is disabled, threw her over my shoulder and ran out of the house." The fire was across the street from a fire station, but it has no water tanker truck due to prior city budget cuts. Neighborhood resident Kathy Sutherland says this is the fourth fire in the community over the past few years. "And to have that fire station not be able to address that fire because they can't move water is a form of insanity," Sutherland said. Fire officials were sympathetic but point out the trucks at the station are equipped to tackle the most important job first. "Our first priority is always going to be getting people out of the building," Salcido said. "So that's what that truck is going to do upon arrival, they're going to make entry into that building and ensure that everyone is out." Crews remained at the scene conducting extensive overhaul operations this afternoon, Salcido said. The American Red Cross was called to assist 12 adults displaced by the fire, according to Salcido.